Slowly but surely I am still managing to sway Bloggers to take part in this series. Let me introduce you to Julie (aka Jules) from The Natural Junkie. She's based in Virginia and her blog covers green & natural beauty, health and lifestyle. I am a recent follower so I'm still getting to know what product Jules enjoys using. Here's what she has to say about her Holy Grail products. It was definitely hard to choose just a few Holy Grail products since I have so many favorites! 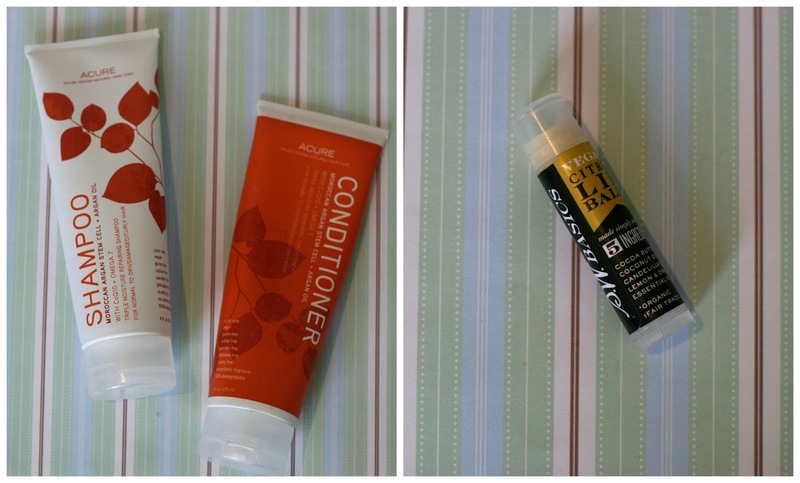 I decided on a few affordable and effective products that will always be essential parts of my routine. Acure Organics Moroccan Argan Oil Shampoo & Conditioner – This shampoo and conditioner has become a staple in my hair care routine. The shampoo gently cleanses without stripping the hair of its natural oils. The conditioner is extremely moisturizing, leaving my hair soft and manageable. It’s the perfect combination for my dry/curly hair.The shampoo also smells amazing with strong notes of sweet almond oil and a hint of berry essential oils. S.W. Basics Vegan Citrus Lip Balm – I am big lip balm junkie but this lip product from S.W. Basics is one that I always come back to. It moisturizes and softens my lips better than any other lip balm I have ever tried. I love the light citrus and cocoa butter scent and the simplicity of the ingredients. It only contains cocoa butter, coconut oil, candelilla wax, and lemon & orange essential oils. This is one lip balm that I am never without! Both these brands get a lot of love in the Green Blogger Community. I was introduced to S.W. Basics when it was known as Sprout. I love the ethos behind the products and the simplicity of ingredients. Anyone else have these products on their wish list or are they already your favourites? Next up we have Tania of Bow Tied Beauty. I have followed Tania's blog for a while now and we seem to have similar tastes in products. Here is what she has to say about her favourite products. It’s been a tough decision to choose just a few holy grail products as I’ve discovered some amazing brands recently, and also returned to some old favourites. My first pick out of the bunch though has to be Trevano’s Organic Day Cream – a nourishing cream that I consistently come back to for it’s skin soothing powers. It calms my irritable skin down in the morning and provides the perfect base for makeup, as well as giving a good dose of hydration throughout the day. 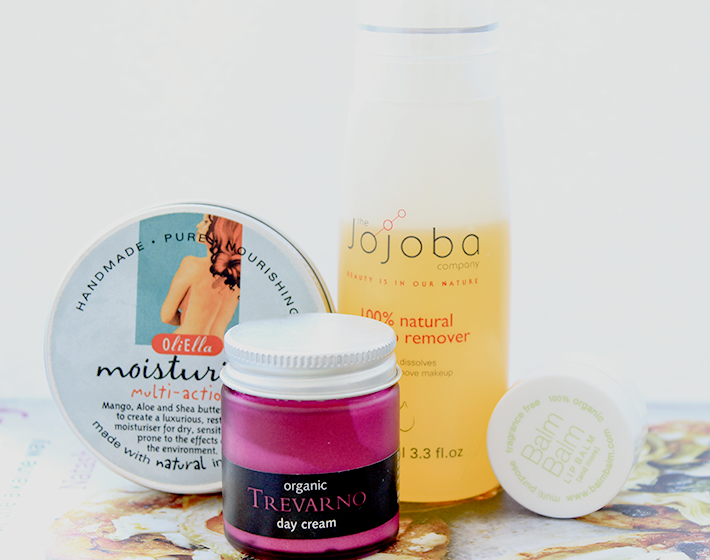 OliElla and The Jojoba Company are two recent discoveries, having not heard of either brand until a couple of months ago, and now I can’t wait to try more from both! The OliElla Multi-Action Moisturiser has been a life-saver for my dry skin and rough patches, whilst the Jojoba makeup remover is a luxury to use at the end of the day, dissolving any traces of makeup easily and leaving my skin feeling silky soft. My last mention is for Balm Balm’s fragrance free lip balm – a longtime handbag essential. This little pot was amazing for my chapped lips during winter, as the formula is highly moisturizing and really helps protects the skin. Even though I don’t need something quite as heavy now, this has been a handy treatment whenever I’m in need of a richer product. The S.W Basics lip balm is amazzzzing, great pick! Haven't tried the citrus one yet, but it sounds great. Wow, I really need to get some Acure according to basically everyone haha. I love the look of The Jojoba Company from Tania too, that's a new one for me.